In ‘Damn the Torpedoes’, Meet Ed the Bald, German Bob and Stafford the Respectable. You will like them. Sympathize as Catherine draws a straight line through the area on the chart marked ‘See Warning,’ and watch her emote as she crosses Georgia Strait in six-foot seas. “My greatest regret,” she says, “is that I’ll die before I get to be thin.” “Damn the Torpedoes!” was nominated for the Leacock Medal. Signed copies are available for $21.95 (CAN). Price includes shipping in Canada. Dook and her neighbors and her long suffering husband, are committed living aboard their sailing vessel off the westcoast of BC. Elegant, witty, and hilarious work is the book to read when you are firmly on land. I bet even her editor won't go sailing with her. 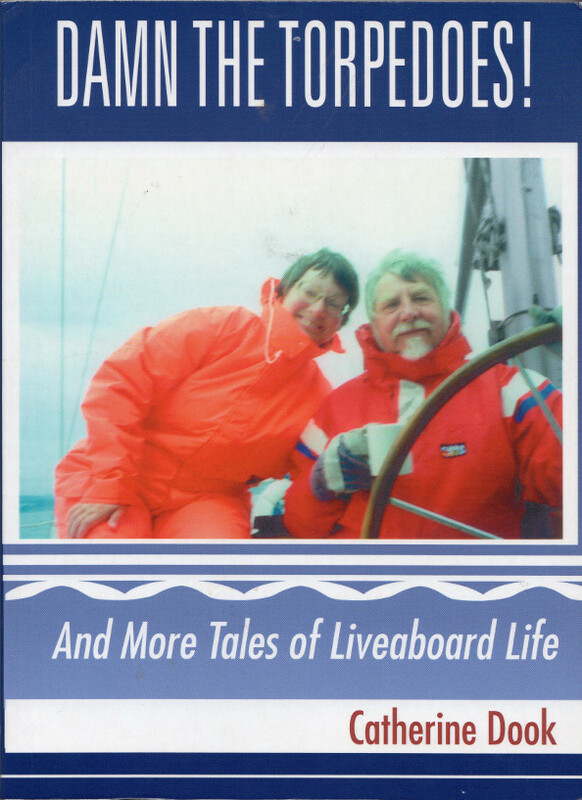 Catherine Dook, one of the west coast's most entertaining writers, is back with a second collection of stories about liveaboard life. Nicknamed "the Dooks of Hazard" by their neighbours along the wharves, Catherine and her husband, John, have called the 44-foot sailboat, Inuksuk, home for four years now - and life isn't getting any calmer. One trip, the Dooks unwittingly sailed through a torpedo-testing range; later, their propeller shaft came apart as they approached a new wharf. Catherine gives more detail on the lives of her fellow dock dwellers, including Older-Than-Dirt Don, Ed the Bald and Stafford the Respectable, and gleefully describes the local pastimes such as interpreting the bird droppings on the decks.Just as warm and witty as her first collection of stories, "Darling Call the Coast Guard, We're on Fire Again! ", Catherine's new volume is a welcome addition to any nautical bookshelf.